As a pirate, I need the ocean to survive. Unfortunately, I live in North Central Florida, and the beach is at least a couple of hours away in every direction. (I know, still pretty lucky) I’ve been craving the beach recently so I took my day off today and decided to make a beach day of it! I packed up my picnic basket, sunscreen and towel and took off for St. Augustine, a place known for its pirate heritage. As I drove into Orangedale, I realized the sky ahead looked pretty ominous. Was my beach day to be ruined by inclement weather? I mentally made alternate plans to wander the old city if a storm was indeed the case. I got to the beach with no rain, but considerable cloud coverage. I parked a little before 2pm at the pier to find that the beach was in the process of being “renourished”, which meant a huge pipe crossed the sand, which stretched considerably farther than the last time I’d been there. The clouds continued to cover the sun and the beach, which didn’t have many people on it, was almost eerily quiet. The sounds of the waves and the sea birds were all that could be heard. It was perfection. I fell asleep on the beach for almost an hour. At that point I was grateful for the clouds, or I would have been a lobster when I woke up! The temperature had dropped to the low seventies and the tide was coming in, though I was still safe. More families had shown up while I was dozing and were playing in the now-nearby water. Two little boys to my right splashed in the surf while their father took pictures. To my right an older man swept his wife up into his arms and threatened to toss her in the water before kissing her and setting her on her feet in the sand, both laughing. Surfers dotted the water all around, catching what small waves popped up. Though it was only 3:45, it felt much later. I ate my picnic lunch and read a library book I’d brought with me (a silly paranormal romance, the best kind of beach read!) for another hour before I felt I was ready to go home. By then the tide was quite high and licking at the ridge below my feet. I stopped by my sister’s and my Mom’s houses for a few hours after, since they live in Jacksonville, which is nearby. We had a late dinner and got caught up before I headed back home to Gainesville. It was a perfect day for a pirate, and I feel rejuvenated and at peace with the universe. 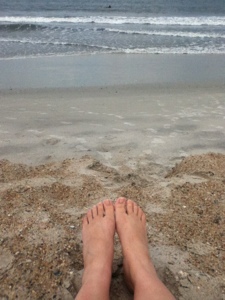 It’s funny how a little thing like a cloudy day at the beach can put the world in perspective. I can’t wait to go back to the library tomorrow!